Tiny elongated bright green young leaves mature to a lustrous dark green in opposite pairs along purple stems of this Shrubby Honeysuckle, excellent low hedging or ground cover. Lonicera nitida maigrun also known as Honeysuckle Maigrun or Honeysuckle May Green is a compact low growing variety of the Lonicera family. It is an evergreen spreading shrub which can be used for both hedging and ground cover it is a tough little shrub and is also resistant to pests and diseases. The Lonicera Nitida Maigrun is a compact variety with its tiny leaves being a bright and vibrant green in colour. It makes an excellent small evergreen hedge. Can be clipped into a compact tidy low hedge or regularly trimmed to form topiary shapes. Although a member of the honeysuckle family, it bears no relation to the growth or habits of that plant and is not a climber. If left untrimmed it can produce creamy white flowers in spring followed by purple coloured berries which will encourage birds and wildlife to the garden. Suitable for sun or shaded areas and although considered hardy does not enjoy cold exposed sites. It will grow in any reasonable soil but does not thrive in wet heavy soil. 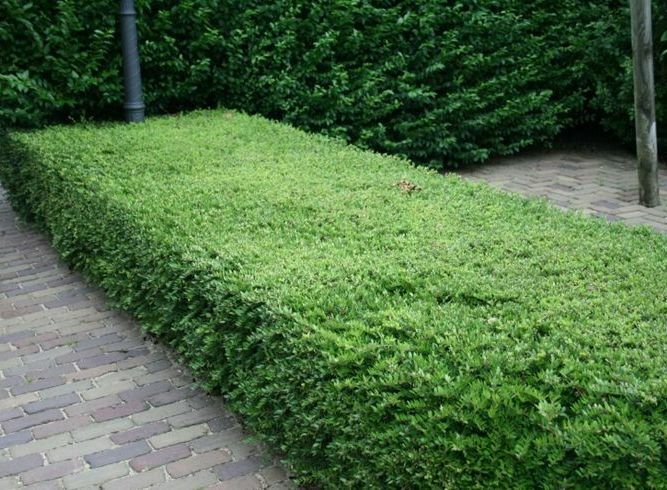 It is not only useful for hedging but makes excellent ground cover. With a growth rate of 20-30cm per year we recommend planting 3-5 plants per metre for hedging to be grown to a height of 50-100cm or as ground cover we would recommend 4-6 plants per square metre. Trimming can take place in spring, summer or autumn. These are sold as bare root plants from November until end of March when they are dormant this is the most economical way to purchase these plants. Bare root plants are only available during this time frame, as so the roots do not get disturbed or damaged when in transit or being planted. Once delivered they need to be planted as soon as possible, to help give them the best start in their new location. For more information on the Lonicera Nitida Maigrun, please feel free to contact our friendly and knowledgeable team, who’ll be more than happy to answer any questions you may have.